If you haven’t heard of uVent, stop what you’re doing and pay attention. It might affect your job, your employer or your business. And if it takes off it will certainly affect reputations. uVent is a consumer complaint platform allowing people to complain about products, service or poor treatment they receive from business. It kicked off last month. The first time I looked PayPal and AAMI were copping it. Now the opening home page tab has a bunch of finance brands, and their number of vents, listed. Importantly, the complaint stays on the site until it is resolved – which means the business has to take action or suffer the continual indignity of a semi-permanent public airing of the complaint. While the site hasn’t been live long it managed to attract a whopping 11,000 complaints in it’s first week. A side note: the business model is interesting. It allows businesses to have premium access not only to respond to their own complaints but to gain leads from complaints about competitors. At least that’s how I read this StartUp Smart interview with founder Anthony Mittelmark. 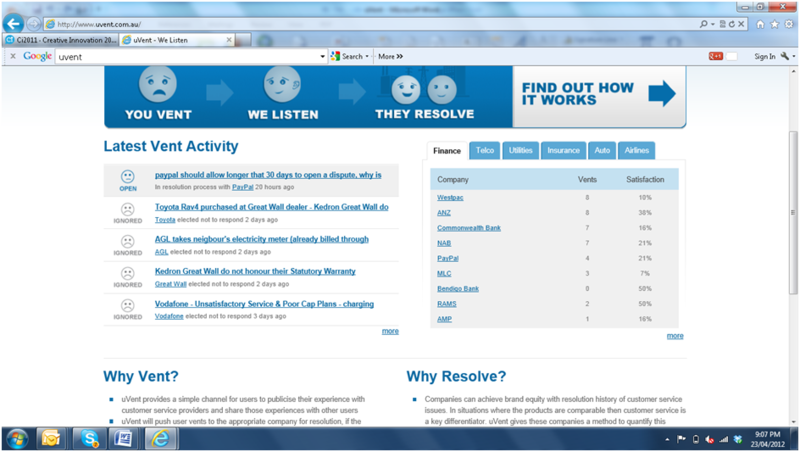 uVent has been designed as a sort of neutral complaint resolution centre. The problem big financial services businesses face is that they’re hampered by internal red tape (also known as compliance ie obeying the law) when it comes to resolving client complaints. The slower they are the more their reputation will be damaged. In fact, it’s the lack of response which drives consumers to sites like uVent in the first place. In the old days clients would complain by phone or letter. Now they do it in a public forum. If you think public complaints don’t make a difference, consider this. Cadbury chocolate developed a new recipe for its chocolates which involved the use of palm oil, a product that has been linked to deforestation in Indonesia. A swelling of objections on Twitter and Facebook forced them to abandon the plan. GASP clothing store lost its reputation and its customers after their poor service was discussed all over the social media, ending up with spots on the major current affairs shows. The store at the centre of the kerfuffle closed its doors. Mind you if you saw the footage you might have gleaned a sense that their spokesperson..well...lacked credibility. But wait, there’s more... Qantas PJs, Domino’s Pizza (ugh), Nestle and even Virgin. Social media makes it easy to damage a corporate reputation. At least online. One comment, another comment and then the snowball effect kicks in. So what’s the response? In many ways uVent is the symptom not the cause. It’s not uVent and sites like it we need to worry about – it’s the way we care for customers and how we handle negative comments on social media. No brand is perfect. And fortunately almost no one participating in social media expects it to be. What they do expect is speed – a response time that can’t wait for three levels of compliance. So a good first step is a social media issues management policy and procedure. Whether dealing with uVent or other online commentary “winging it” won’t cut it. What can help is listening – and a prepared approach to issues resolution and customer care. Knowing what you can do and say, and how - before it happens, is a good start. Please double check the 11,000 rants claim. There is a max of only 250 posts on the site and majority are whacko rants. The companies falling for this ransom market can be counted on 1 hand. Dont fall for the PR hype. Hi D. You may well be right. It will be interesting to see whether the big brands play ball. If they don't, it seens the business model doesn't work. As I went through uVent again just now I can see why you're questioning the 11,000 figure. It came from a news outlet...who maybe didn't check their facts...and I re-published it. I think it's safe to say uvent has been a complete failure. I'd be really interested in reading a follow up to this article.